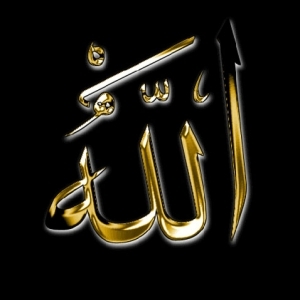 The word “Allah” is the proper name of The One God. Literally it is made up of the letters “al” which is the definite article “the,” and “ilah” the word for god or God (according to context as above). Thus the word “Allah” is “al-ilah” and literally “The God,” as in the Arabic phonetic construction (ال + إله = اللَّهُ). Of course the meaning is the One and Only God and the One Lord and Creator and Sovereign of the creation. YHWH is a tetragrammaton (four vowels for four words), which in Hebrew uses the letters י‎ (yodh) ה‎ (heh) ו‎ (vav) ה‎ (heh) or יהוה‎ (reading right to left = YHVH, or with the Biblical Hebrew pronunciation, YHWH) called Yahweh (and written and read from right to left as in other Semitic languages Arabic and Aramaic). This unique word is a specific way used by the Jews of expressing the sacred personal name of God without writing or uttering the actual word which may debase it by too frequent or improper usage, in fear being a form of blasphemy, for as it is written, “7Thou shalt not take the name of the LORD (YHWH) thy God in vain; for the LORD will not hold him guiltless that taketh his name in vain.” KJV: Exodus 20:7] The meaning of the word is according to some scholars in the third person “He Is” or “He Exists” (the first person would be “I Am’) and said to mean “He who causes to be” and describes the being who is the self-existing one giving others existence. To avoid mentioning YHWH in respect they substituted saying Adonai or Adonay translated as “the Lord.” Some Christian scholars introduced the name Jehovah for YHWH. English belongs to the family of languages that has been designated as “Indo-European” because the Indian dialects and the European dialects descend from the prehistoric proto-Indo-European language of pastoral Aryans of Central Asia about 4500 B.C. Concerning the word -G O D- the Catholic Encyclopedia mentions that the English word god and God is the “(Anglo-Saxon God; German Gott; akin to Persian khoda; Hindu khooda). The root-meaning of the name (from Gothic root gheu; Sanskrit hub or emu, “to invoke or to sacrifice to”) is either “the one invoked” or “the one sacrificed to.” 6 The Oxford English Dictionary gives a detailed etymology and says: “The word God is derived from the old Teutonic form gudo which means that which is invoked (or worshipped) by sacrifice … The ulterior etymology is disputed. …There are two Aryan roots of the required form … one meaning ‘to invoke’ (Skr. hū), the other ‘to pour, to offer sacrifice’ … Either of these conjectures is fairly plausible, as they both yield a sense practically coincident with the most obvious definition deducible from the actual use of the word, ‘an object of worship.’” 7 Thus the generic word “god” in English and “ilah” in Arabic both basically denote an object of worship, and God with the capital “G’ and Allah are for the One Who is worshipped rightfully since He is the God, the One and only Creator. “They are not anything except mere names that you have named designated, you and your forefathers, for which Allah has sent down no authority. They do not follow anything except assumption and what their souls desire, and there has already come to them from their Lord guidance.” (53:23) This verse identifies false assumptions and wicked desires as the basis of all sins and evil actions. When we translate the creed of Islam, the testimony of faith, which says, LA ILAHA ILL-A-LLAH, (or la ilaaha illallah) we usually translate it as, “There is no god except Allah” or with the more explanatory phrase considering the intended meaning, “there is nothing worthy of worship except Allah.” All monotheists no matter what language they speak say, there is only One God and that all so called gods with a small ‘g’ and other deities don’t exist, and, therefore, all worship rendered to these gods is false and useless idol worship. We find numerous statements in the Bible similar to the creed of Islam, for instance, the saying of Moses, peace be upon him, “The Lord our God is one Lord; and you shall love the Lord your God with all your heart, and with all your soul, and with all your might.” (Deuteronomy 6:4), and the saying of Jesus peace be upon him, “The Lord our God, the Lord is one; and you shall love the Lord your God with all your heart, and with all your soul, and with all your mind, and with all your strength,” (Mark 12:28-30 and Matthew 22:37), and the statement, “There is no God but One.” [1 Corinthians 8:4]. 1 This outrageous claim is prevalent nowadays on the internet especially among Christian evangelicals who wish to malign Islam falsely. One African friend informed me that as a child the Christian missionaries in his land of Zimbabwe (called Rhodesia at the time) told him that Muslims worship the moon and that is why the crescent is a symbol of Islam on flags and so forth. 3 See “alef-lamed-heh” (ALH) in the “Milon Ben-Y’hudaah, Ivri-Angli” (Ben Yehuda’s Hebrew-English Dictionary), and various reputable online dictionary and encyclopedias. 4 In narrations reported in the Sunan literature and verified by Sheikh al-Albani as in his Sahih al-Jame’as-Sagheer # 979, 980, 982, and as-Silsalah as-Sahihah # 746 and other books, and Sheikh al-Arna`ut in his verification of Musnad Ahmad # 12226 and Hussein Asad in his verification of Sunan ad-Darami #3389. 5 Reported by Ibn Jareer at-Tabari and Ibn Abi Haatim, and mentioned by many with confirmation. You are really a just right webmaster. The web site loading velocity is amazing. It sort of feels that you’re doing any unique trick. Furthermore, The contents are masterpiece. you’ve performed a great process on this matter! Nice post. I was checking continuously this blog and I’m impressed! Very useful info specially the remaining phase :) I care for such info much. I was looking for this particular information for a long time. Thanks and best of luck. Hi my loved one! I wish to say that this post is awesome, great written and come with almost all significant infos. I’d like to peer more posts like this .